Jordan Boyer | The Daily Eastern News Astoria Griggs- Burns a senior health administration major, and Parrish Amos a junior English major, sing on stage at “Ladies and Hip-Hop” Monday night at the 7th Street Underground. Essence Chatman a public relations major, and Kennedi Jackson a sophomore communication studies major, sing on stage at “Ladies and Hip-Hop” Monday night in the 7th Street Underground. 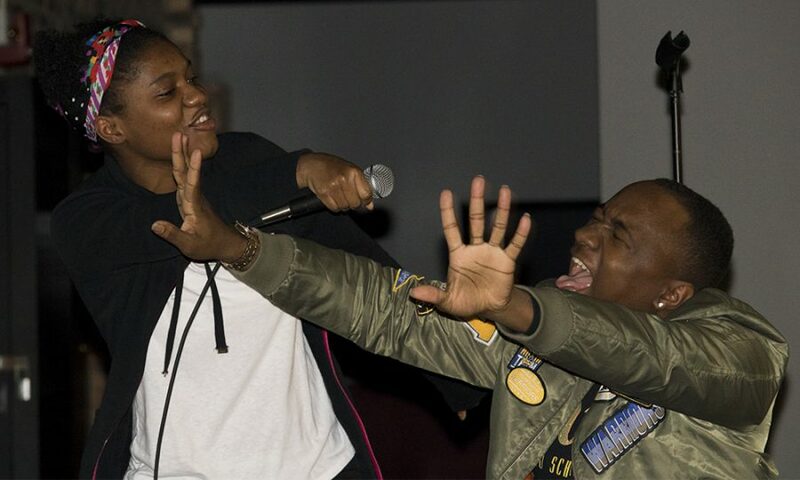 Both of them hosted the event.The National Association of Colored Women’s Club had students singing their lungs out during the “Ladies In Hip-Hop” karaoke and game night Monday in the 7th Street Underground of the Martin Luther King Jr. University Union. 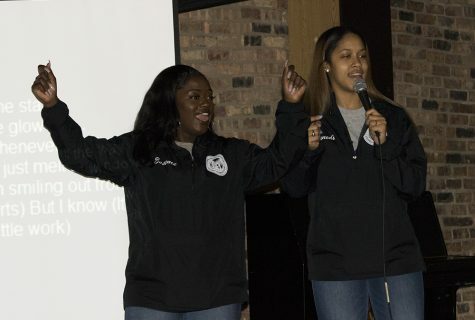 The National Association of Colored Women’s Club had students singing their lungs out during the “Ladies In Hip-Hop” karaoke and game night Monday in the 7th Street Underground of the Martin Luther King Jr. University Union. Kennedi Jackson, the event coordinator for NACWC, said she was inspired to put the event together because of the lack of knowledge and recognition when it comes to African-American female artists. She said it was important that the NACWC ladies show how valuable black women are in society. Jackson said hip-hop was picked as the ideal theme for the event because hip-hop is one of the music genres in which black women are wrongfully portrayed. She said that means they are often sexualized or called ghetto. “This was our chance to show or teach the audience that black women are much more than that,” she said. To steer people away from what they tend to think about black female artists, the organization decided to play a Kahoot! style guessing game. This gave the audience a learning experience about what media does not often portray about black female artists. The audience used their phones to answer a variety of questions, like who wrote songs, which artist sang a specific song and what is the name of such songs. Astoria Griggs-Burns, a senior health administration major, said she did not know that a Syracuse University actually offered a course about the artist Lil Kim, which was an answer to one of the questions. “It was very surprising to learn about that,” she said. Others were also surprised to learn that artist Toni Braxton earned a teaching degree from Bowie State University. Following the Kahoot game, the event proceeded with karaoke. Audience members sang along to multiple throwback Hip-Hop songs. Ariel Taylor, a family-consumer-sciences major, was the first participant to sing karaoke. She said she sang along to her favorite artist Lauren Hill. However, karaoke was not limited to only black female artists. Before the night ended the NACWC ladies and part of the audience got up on stage and sang along to “Can You Stand the Rain” by New Edition, a black male group artist.